The benediction “may you live in interesting times” is, of course, an ironic curse. But, so also would be that one should preside over tedious times. It is one of the paradoxes of life that often its most difficult and trying periods and experiences are the most memorable and enriching. Men have come home from war only to remember its dangers and horrors as the most adventurous and thrilling times of their lives. The traveler is just as likely to find his most difficult events those that make for the best stories. It is frequently the accursed “interesting times” that shape our character and give definition to our lives. Good histories and particularly biography autobiography are usually recollections of interesting times, and the three books reviewed here, part of my reading and research on Chinese history, have been classified as “witnesses” because they are written by, or about, three men that have been close to people and events that have significantly influenced that history. Two are Westerners and one Chinese. The Scotsman was interested in a foreign service career from an early age (perhaps owing to an unhappy home life), but the colonial posting of choice in those days as India, not China. After reading history at Oxford he was accepted for a Hong Kong “cadetship” in 1898, a year significant for the Crown Colony’s acquisition of a ninety-nine-year lease on the New Territories and Weihaiwei in northern China. He immediately began learning Cantonese, at which he became fluent, and forming an affection for all things Chinese, especially the language, food and Buddhism, to which he converted. A lot of colonial work was administrative and he was tasked with land registry in the New Territories, which involved quasi-judicial functions of sorting out disputes over traditional land claims. After an extended and bold period of travel from Burma to Tibet to Peking, during which time he acquired Mandarin he was posted to Weihaiwei where he functioned as a magistrate for several years until he was offered the post of English tutor to the 13-year-old Emperor of China (in title only, since his abdication) Pu Yi. 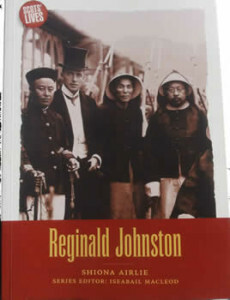 * The Emperor was allowed to remain, in a form of imprisonment, in the Forbidden City, where Johnston not only taught him English and Western manners, but also became his lifelong friend and was a witness to the end of the imperial China, the birth and end of the Republic, the Japanese invasion and the emergence of the Communist state. Rittenberg. There were witnesses so influenced by their own leftist political ideology, they might be regarded as “ red converts.” One American who falls into this category is Sidney Rittenberg who had been involved in labor movements in the United States and fell in the thrall of the Chinese Communists. Rittenberg’s passage was by way of the U.S. Army in which the labor activist from South Carolina learned Mandarin and was shipped off to Kunming in 1945 as WWII had just concluded and China was turning on itself in civil war. The US had been helping China fight off the Japanese who were now vanquished and gone, and so would most of the Americans. But Sidney Rittenberg remained behind. Some of the Americans would remain a presence in China, presumably to establish a relationship with whatever government would emerge from the chaos. They had been allies to both the KMT and the Communists against the Japanese, but now the choice would be made to make alliance with Chiang Kai-shek and his forces which head been the recipient of the best and the bulk of American military aid. Both sides were now competing for the left over weapons of the Japanese and eventually they claim to be the legitimate government of China. Rittenberg began his tenure with the KMT, but eventually, both physically and ideologically, made his way to the other side. 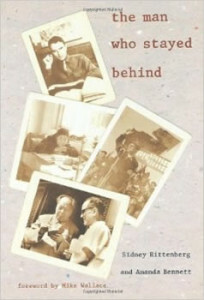 It was the beginning of a fascinating thirty-five year tenure in China during which he would earn the friendship of Zhou En-lai, become a broadcaster for the Communist Party, be twice accused as a spy and jailed for a total of sixteen years, emerge to become one of the only Western members of the Chinese Communist Party, become a translator of the works of Mao Zedong into English, marry a Chinese coworker who would become his wife of over fifty years and mother of his four children and who would eventually repatriate to the USA with him where, at this writing, the nonagenarian remains active as a respected sinologist, consultant, and professor. There are many “takeaways” from Rittenberg’s first-person account of his witness and participation in the tumultuous early years of the Chinese Communist revolution, but one of the central facts is the very internal terror of that movement is how Rittenberg managed to remain loyal to that movement is astounding. Only after his second, ten-year, incarceration, during which the Cultural Revolution visited havoc on his family did he admit that political realities had drifted far from his ideological moorings. It is only near the end of this five-hundred-page book that Rittenberg is able to admit to the corruption that had undermined the Party. Unlike Rittenberg, Dr. Li comes into Mao’s orbit after he has succeeded in besting the KMT and has established himself as leader of the party and the state in the party enclave of Zhongnanhai in Beijing. It is at the point where the clever military leader, politician, and ideological spokesperson, can now give his personal eccentricities full reign. Perhaps no other political figure in history has been as intimately observed as a model was by the physician that he commanded to attend to him for over the last two decades of his life. Dr. Li, who came from an upper-class family and was trained at an American sponsored school in Suzhou, spent years away from his own wife and children attending to his patient’s health as well as trying to survive the intrigues and other dangers of being close to the apex of power and the ambitions and machinations of those who gravitated around it. Much is already known about Mao’s public life, but his private life was just as fascinating. Like many absolute rulers, he lost all perspective, suffered no personal consequences for his decisions, and was continually deceived by those closest to him. But Mao was the better at deception. He controlled those in his inner circle through fear, using his silences, obliqueness, and plenipotentiary power to keep them always on their guard and competing for his favor. He could turn on them in spite of their loyalty, ignored their suffering (as he did in denying Zhou En-lai surgery for his cancer), and supplement the exile, prison, or to execution with the same lack of emotion he exercised in imposing misery and starvation on millions of the faceless masses in his reckless pursuit of wrongheaded economic policies. 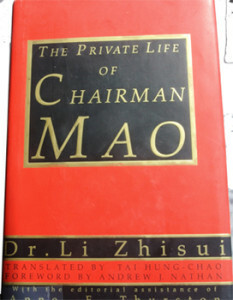 Dr. Li lived in constant terror that he would be blamed for Mao’s illnesses or death. Mao’s personal habits only exacerbated that fear. His diet was mostly oily foods, his teeth were green since he only rinsed them with tea rather than brushing, that than bathe he preferred being rubbed down with hot towels, and he kept no sleeping pattern, often working during the night. More threatening were his sexual habits: the Chairman regularly recruited fresh young girls for his bed, usually from the countryside and, apparently had some sexually transmitted diseases that Dr. Li treated him for (in addition to supplying him with barbiturates for his anxiety and injections to enhance his virility) hut which Mao expressed no concern about passing on to these young girls who were proud to service their smelly, diseased dictator. We this account that Mao, who finally succumbed two cardiopulmonary failure when he was over eighty years old, had a surprisingly strong physical constitution that was only matched by his surprisingly strong resistance to any moral restraint or culpability for the misery inflicted not only on those who came into contact with him but those who suffered from his ill-conceived policies. At one point, when informed that his agricultural policies have resulted in the death by starvation of millions of his countrymen, he passed off the information with the comment that the Chinese could easily replace them because they were good breeders. The official line in China is that Mao’s accomplishments somehow outweighed his disastrous mistakes. Ironically, his picture is often shown with the Chinese characters that admonish the leadership two “serve the people.” But, up close and personal, as witnessed by Dr. Li and experienced by Sidney Rittenberg, Mao’s epitaph would more appropriately be that “power corrupts, and absolute power corrupts absolutely.” We will never know, but China might have been better off with Pu Yi. *See his From Peking to Mandalay: A Journey from North China through Tibetan Sich’uan and Yunnan (1908). The magistrate function is described by another British foreign service officer, Austin Coates, who served later in the Hong Kong New Territories. See Myself a Mandarin(1968). **It is noteworthy that Johnston’s voluminous correspondence and journals that he had dragged with him throughout his postings and travels were burned by his wife to the chagrin of China scholars and biographers. A similar cremation of scholarly works was committed by the wife of another Oxford British linguist, prolific autho,r and traveler, Sir Richard Francis Burton (1821-1890) immediately upon his death.